Long ears without black tips, long hind legs.Head/body length: up to 400mm.Weight: 1200-2000g. Male usually heavier. 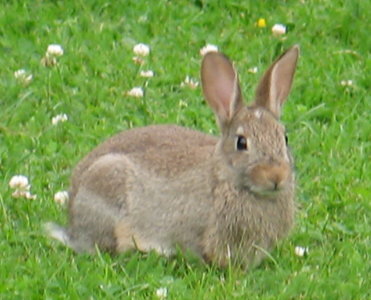 Rabbits were introduced to Britain by the Normans in the 12th century to provide meat and fur.they where originally from the western Mediterranean Rabbits are now widespread throughout Britain and Ireland, but are absent from Rum and Isles of Scilly.Rabbits can be found almost anywhere they can burrow; sand dunes, railway verges and even in urban areas. Suitable areas are those where the burrow area and food supply are side-by-side, such as woodland edge and hedgerows. Open warrens are maintained where good burrowing conditions exist on areas of short grass, sand dunes, railway verges and even in urban areas.Rabbits are rarely found above the tree-line and avoid damp conditions and areas deep in conifer woodland. Warrens consist of random network of tunnels, dens and bolt holes Tunnelling is undertaken predominantly by the female. The depth of the burrows depends on the nature of the soil and the height of the water table. Large warrens usually imply a high population of rabbits. Rabbits diet include a wide range of plants including grasses, cereal crops, root vegetables and young shoots of meadow plants. They will eat tree bark especially when snow covers other food sources. Rabbits are normally nocturnal but will come out in daylight if undisturbed, especially during the long days of summer. Social groups vary from a single pair to up to 30 rabbits using the same warren. Within large groups there is a distinct social hierarchy. Origins of status are not known. The most dominant males, known as bucks, have priority of access to females, known as does. The most dominant does have access to the best nest sites. Bucks and does seldom fight with each other. Competition between does for nest sites can lead to serious injuries and death. In groups with more than one female and more than one male rabbits are not monogamous. Lower ranking rabbits may be forced to breed in single entrance breeding "stops" away from the main burrows where they and their young are more vulnerable to predators. The breeding season is mainly from January to August, starting later in the North of Britain. Healthy females can produce one litter of 3-7 young per month during the season. The doe constructs a nest inside the burrow from grass bedding and lines it with soft fur from her chest and belly. Young rabiits are , known as kittens are born blind, deaf and almost hairless. Bucks are able to mate at 4 months, does at 3.5 months. Rabbits don't often live for more than 3 years. Over 90% die in the first year of life, most of these in the first three months. Young rabbits are preyed on by badgers, buzzards and weasels. Rabbits of all ages are taken by foxes, cats, stoats and polecats. Rabbits have no legal protection in Britain and landowners are required to prevent them from damaging neighbours land. In the middle of the 19th century rabbit numbers began to increase dramatically until they became major agricultural pests. Their increase was due to the large scale planting of hedgerows (a result of years of enclosure acts) providing rabbits with shelter and opportunity to burrow in loosened soil; new agricultural technology increased cereal production giving rabbits an easily accessible food supply and large numbers of the rabbits' natural predators were killed by gamekeepers on new shooting estates. During the war rabbit control methods were relaxed and numbers increased rapidly. Rabbits destroyed approximately £50 million worth of crops per year circa 1950 . In the early 1950s the virus myxomatosis occurred in Britain. The first record of a rabbit dying of the disease came in 1952 and within 2 years 99% of the population had died. The disease has become less virulent and rabbits are developing resistance, but outbreaks still occur. The population has largely recovered and rabbit damage is estimated at over £100 million/year. 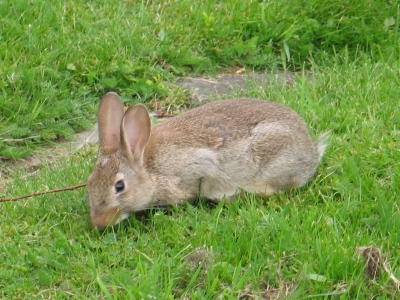 Rabbit viral haemorrhagic disease (VHD) was found for the first time in wild rabbits in 1994. It is not yet widespread and the full implications are not known, but many rabbits will be killed. Rabbit management continues using gassing, trapping, ferreting, snares, shooting and fencing. Grazing by rabbits can be very beneficial to maintain the diversity of habitats such as chalk grassland, heathland and sand dunes. When rabbit numbers crashed following the introduction of myxomatosis, many grassland habitats changed to scrub with loss of associated wildlife such as the large blue butterfly. Why do rabbits thump their back legs?